As the title says, this is a module that allows you to translate Atom themes from your WordPress Dashboard. The advantage over PoEdit is that the strings are automatically synchronized after theme updates (you don’t need to copy the theme files on your computer and set up paths anymore), and plural form definitions are auto-detected based on your current site language. Your translation will become active just after you push the save button (.mo and .po files are created in your child theme folder). 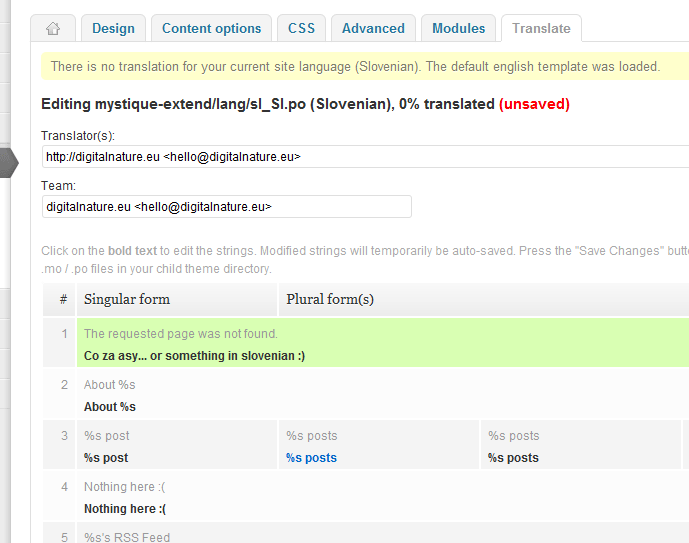 I might port this to a plugin when I have the time, so that people can translate plugins or other themes too. Post your suggestions or encountered bugs in the comments.